I’m starting my Adventure game play-through in 1993, the year after Monkey Island 2 came out. I’d played all the games in my selection before, though not for quite a while. This became evident after purchasing Gabriel Knight off GoG, and I realized I had no music at all. After about 90 gagillion hours I finally figured out that Windows 8 & 10 don’t actually have midi support, and then after messing about further I finally got it to work.Let it not be said I am not committed to this project. (I am also aware there is a remake on mobile, however it changes puzzle flow and has re-recorded VO). 1993 was blessed with a lot of adventure games, and it was quite hard to pick what ones to play. * Most of the time they tried to sell me lemmings or else lemmings came free with a lot of other games. I am not going to play lemmings. Lure of the temptress has several interesting features right from the start. It uses the ‘virtual theater’ system which allows NPCs to move from screen to screen. You can if you want follow them or at some points in the game an NPC will follow you. If you bump into them , they’ll say something and NPCs can also be given fairly complex strings of commands. This means that you can instruct the other character to go into another room and pull a series of levers, or press a button at theoretically the same time as the player.I say theoretically because the pathfinding can be extremely awkward, if your character takes to long to path to the target NPC or gets stuck then command will time out and end up with both characters standing around with a question mark over their head. It’s also fairly easy to loose Ratpouch your companion from the start of the game. I ended up needing him for a puzzle and having to traipse back the way I came to find where he’d gotten stuck. It’s a shame because Ratpouch’s semi autonomy leads to several funny points in the game. If you enter the rougher pub in town, he’ll try and buy beer from the barkeep. There are a few brief cut scenes that manage to do a lot with very little animation, and it’s a shame there aren’t a few more. The story is a little bare bones, but in enhanced by pockets of very funny dialog. There’s also combat near the end of the game, which I beat somehow. Lure of the Temptress hasn’t aged well control wise, there’s a lot of wandering about trying to get things to happen, and the jankyness of the pathfinding makes it fiddly to play. However the use of NPCs is really interesting, they act more like characters from an open world RPG wandering around and interacting with each other. It’s a system that very few other straight up adventures ever used and adds a bit of life to the town. Similarly it’s the snatches of very funny duologue that shine in a fairly average story. 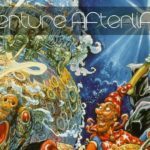 Since of my aims in this blog series is to cover interesting things about adventure games, I urge you stick with me for 1994 for Revolution’s next game which took these two elements and ran with them. In 1993 if an adventure game had voices it was a talkie, and despite a spate of awfully voiced games in this period Simon the Sorcerer cast Red Dwarf’s Chris Barrie as the title character. Simon is meant to be a young teen in this, and despite what a think is a slight pitch shift Barrie is probably a little old. However he and the rest of the voice cast are excellent. The gameplay is fairly standard in adventure games, the puzzles largely make sense although there are a few utterly frustrating points which let the game down somewhat. At at least four points in the game you need to find some kind of small rock. Several of which use the same sprite in the inventory. These rocks are usually hidden somewhere on the floor….or these wonderful incredibly densely packed pixel backgrounds. But only certain rocks on certain screens can be picked up and used. This happens four times in the game with rocks alone. The final part of the game features a lot of weird dead ends. A small wooden wedge appears then disappears from your inventory. Simon picks up and can polish a shield, only to leave it hanging on the wall as he enters the final area where it’s never used. Whilst the game is still completable these numerous dead ends toward the end of the game are frustrating. Whilst the fast travel map is a great way to backtrack, it only features select locations. It also doesn’t hint if you’ve missed something, especially annoying when several screens have exits you can only leave when you click on the right object ( usually something Simon has to climb). Despite these flaws, Simon is still a funny game. The talking wood worm stuck with me for years after I originally played it ( on an Amiga CD 32 no less, puzzle hunting is not fin with a gamepad). Interestingly it also moves save/load and fast travel to inventory items. This means with the verbs and inventory permanently taking up the bottom half screen the top half is almost never obscured. Gabriel Knight was the most serious of the three games I played. There are a number of notable voices in the game; Tim Curry voices the lead character Gabriel, Mark Hamill voices his best friend Detective Mosely and Michael Dorn appears as Dr John the creepy head of the local voodoo museum. There’s a bit of pixel hunting in Gabriel Knight, and you can get frustratingly far into the game then grind to a massive halt without even realizing that items can be that hidden. In it’s defense in nowhere in the game does Gabriel have to pick up four tiny bespoke rocks. When Gabriel gets on a bike FMV happens for the only time until Gabriel Knight 2. The game has two main narrative threads Gabriel’s family history, and a series of ‘voodoo’ murders.These interweave as you go on and you can make quite a big discovery about Gabriel’s family on the first day via solving a really obtuse puzzle. You can also do what I did ( despite having played it before), and forget about it assuming that the puzzle can’t be solved only to grind to a halt later because you arbitrarily need to solve it before the day will end and new events trigger. Gabriel can also die, but the only way you’d know that is if it happens to you. If you do die you’d better hope you’ve saved recently. Lure of the Temptress at least alerts you to the fact you can die by making it fairly likely to happen at least once near the start of the game. Whilst digging around I found this making of doc for Gabriel Knight. Gabriel himself is an interesting character, a lot of his traits are very useful for an adventure game character to have. He’s selfish, likes to steal things (especially from police friend Mosely) and lies a lot. Gabriel also has a pretty horrible attitude to women, (you even have to use the ‘pick up’ command on a female character urch). However Gabriel does have an arc, he starts off investigating the murders and irritating his friend Mosely as a way to let of the the stress of his writer’s block; by the end he actively cares about the case and steps up. All three of the games I played featured fantastical elements, and to some extend featured the same flaws hiding objects unfairly and failing to communicate what the player has to do to pass. Simon and Gabriel both feel like characters you wouldn’t find in other genres of games, even if in Gabriel’s case you don’t always like them completely.